Throughout the rest of the week, Microsoft will be rolling out a new security upgrade for its accounts, which will provide a new two-step verification process. 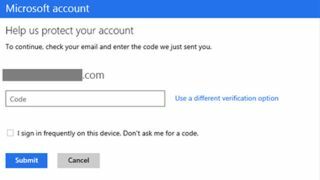 The accounts affected include Outlook, Skype, SkyDrive, Xbox and anything else that used to fall under the old Windows Live ID banner. With more than 700 million people using Microsoft accounts on various devices around the globe, that's a lot of potential users that will no doubt benefit from stronger security provided by the new two-step process. The optional process has already been offered for services at commerce.microsoft.com and xbox.com, but is now being opened up to the rest of the Microsoft-using public. While you can still use just the standard password to access any of your networking or email accounts, the voluntary second step requires a unique code to also be entered. This code is activated and sent to secondary devices or email accounts once you decide to take the necessary action to activate this new dual-layer measure. If you want to take advantage of the added layer of security, all you have to do is visit the Management page to get started. Some Microsoft apps and devices, like the Xbox 360, don't allow for two-step security. However, you can set up a specialized password specific to that device for added defense. Once you have set the new level of security up on your devices (laptops, phones, etc. ), you set them to "trusted," so you only have to enter the password/code combo the first time it's activated. Other companies like Google and Facebook already use such security measures to provide as much of a barrier against hackers as possible. Seeing Microsoft take the necessary steps to help its user base stay safe as well as it can bodes well for the foreseeable future, but such tactics will only work as long as the consumers make use of them.